*Access the gallery by clicking on the image below. Welcome to AggieGreats.com!! 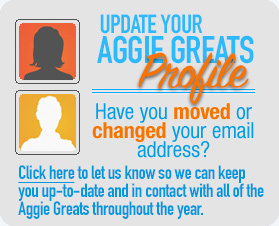 AggieGreats is the new name selected(suggested by Antoine Puech) to replace Craggies. This is an effort to welcome all retired Ag employees to include not only Union Carbide Ag employees but also Ag employees of Amchem, Rhone Poulenc, Agrevo, Aventis and Bayer. Welcome To All Of Our Retired AggieGreats. WERE YOU THERE? DID YOU MISS IT? On Friday, October 2, 2015 the Craggies began arriving once again at the Sheraton Imperial. They were anticipating seeing old friends and meeting new friends. This year there was more time to visit again since the entire weekend’s venue was at the hotel. Ask anyone who attended and they will tell you the 2015 Reunion was the best ever! They could go to the Hospitality Suite after dinner and enjoy their friends and they did just that. On Friday night dinner was an Italian Buffet in the Royal Room. Saturday morning brought the usual golf outing coordinated by Henry Yang. Unfortunately it had to be cancelled due to the rainy weather. Mid afternoon a good number of attendees enjoyed a Bayer Ag Presentation by Ken Kukorowski. We learned alot of new things about Bayer. On Saturday night dinner was a sit down affair in the Crystal Ball Room with Horace Johnson emceeing the after dinner fun. After that most folks took off to the Bull Durham/Hospitality Suite for more fun and visiting. There are plenty of pictures in the Gallery to the right for you to see. Please take time to look at and enjoy them. We are all looking forward to number VIII in 2017. So all of you reading this, please plan to come and mark your calendar for September 29 and 30, 2017. Watch this site for more information as we begin the planning in early 2017. Join us for another great event! Take our Member Survey Who to Contact Who Attended? For more information on registration. For a brief glance at this years Aggie Greats Reunion schedule look to the right. Our Mission: "To provide a forum for former Ag Products Employees to network and have fun." Copyright 2010 - 2016 Craggies Reunion. All rights Reserved!